Letter from the Midwest differs from my previous “Letters.” It is a quick romp through parts of the Midwest where there have been interesting exhibitions. While “there is good art everywhere” to quote myself, we can’t get everywhere, so I hope this snapshot gives you an impression of some of the exhibitions, or it inspires you to make a trip to Chicago or Indianapolis where I am highlighting several venues. First, I have to cover the “David Bowie Is” which opened at the Museum of Contemporary Art on September 23, 2014 and continues through January 4, 2015. Go see this exhibition even if you are not a rock and roll fan. It is a stunning presentation that marries rock, art history (ancient and recent), film documentation, Bowie’s costumes, videos of live performances and his sketches, drawing and paintings. His paintings aren’t great, but he paints better than I sing. Ancient Kouri from Delphi underscore David Bowie’s research on figures. 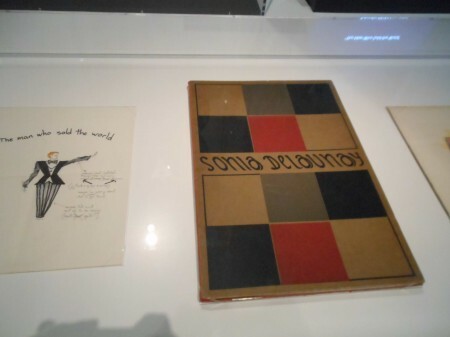 Bowie calls upon the abstract designs of early 20th century artist Sonia Delaney. Everyone knows the lyrics “Ground control to Major Tom” from Bowie’s Space Oddity album. The song was written when he was 22. How about the song “Modern Love” from Let’s Dance (1983), “Young Americans” from his 1977 “heroes” album, “Ziggy Stardust” and “Moonage Daydreams” from his Ziggy Stardust album (1972) and “Changes” from the 1971 “Hunky Dory” album? These songs and albums are in the rock and roll lexicon. 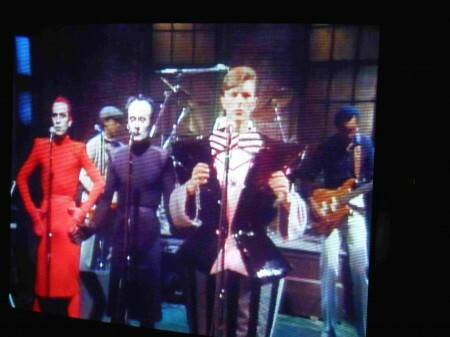 But Bowie is much, much more than a songwriter and singer. 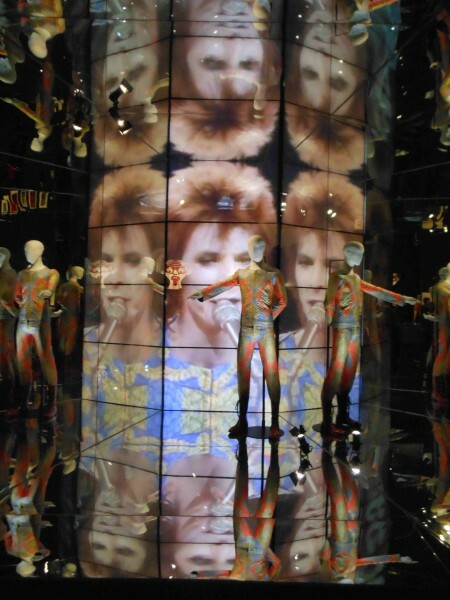 The Victoria and Albert Museum, London organized the exhibition, “David Bowie Is”. Michael Darling, the MCA James W. Alsdorf Chief Curator says it best: “This exhibition portrays an artist in control of his practice who recognizes that the smallest details contribute to the overall aesthetic experience of the audience. Bowie’s peerless understanding of the importance of image cultivation and reinvention make him a comfortable fit with others in the MCA Collection and exhibition history, such as Cindy Sherman and Andy Warhol—and similar to many artists working today, he has never limited himself to one area of cultural production. The exhibition “focuses on his creative processes and collaborative work with artists and designers, and demonstrates how his work has both influenced and been influenced by wider movements in art, design, music, and theater. The exhibition’s multimedia design introduces advanced sound technology by Sennheiser and video installations to create an immersive journey through Bowie’s artistic life. 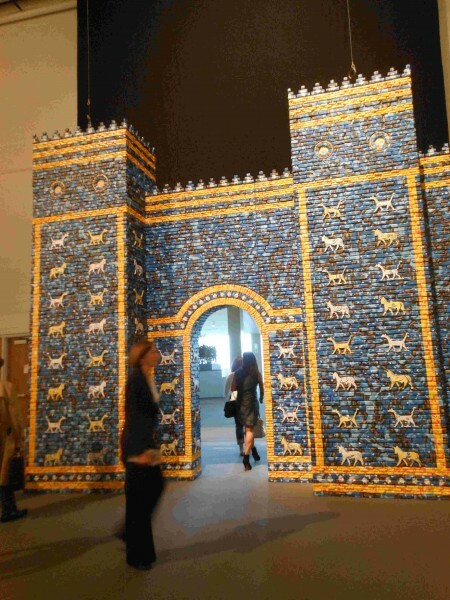 Entrance to exhibition hall features replica of Iraqi mosaic city entranceway. From September 17-20, EXPO CHICAGO, the International Exposition of Contemporary and Modern Art, hosted over 120 leading international galleries at Festival Hall at Navy Pier. Expo Chicago represents 16 different countries and 35 different cities. Navy Pier was the site of the original fairs, beginning in about 1980 and it is, in my opinion, the best place to host this important fair. It is not Art Basel Miami, which is the chic, upscale venue, featured caustically in a Vanity Fair article last year. Oh those Russian oligarchs in search of the hippest most illusive new art…. Here, it may not be as exciting, but it is near at hand and there were a lot of alternative spaces and special projects, which made it tremendously interesting. Some highlights: the huge paper-maiche-like Bagdad city walls at the entrance to the venue and miniatures of artifacts lost, stolen, looted or destroyed during the first days of the wars in Iraq. Each artifact is accompanied by a touching or sober quote from an Iraqi museum curator or historian, pointing to the rarity of the object that is gone. In some case, objects were recovered. 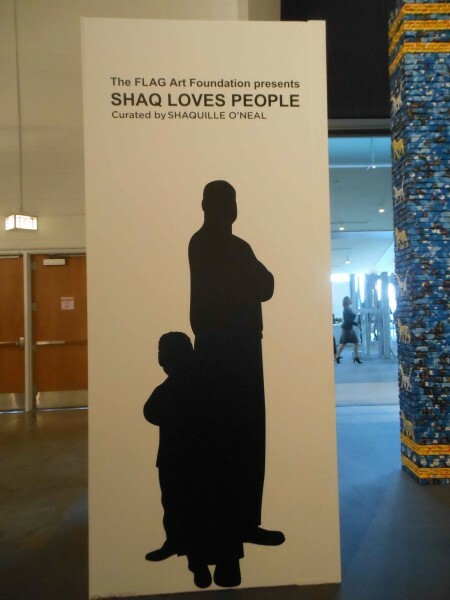 Then there was “Shaq Loves People.” Where have I been? Shaq has been an art curator for some time now apparently. Artists submitted figural art works, which he personally selected for viewing. The works are charming. If Shaq spends a lot of money collecting original art, I am all for this. 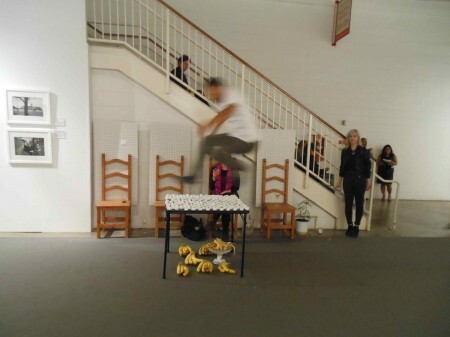 “Jumping Bananas” is one of the alternative performances which is simply fun, with underlying questions about how easily we mishear/misread/misunderstand, not to mention jump to conclusions. 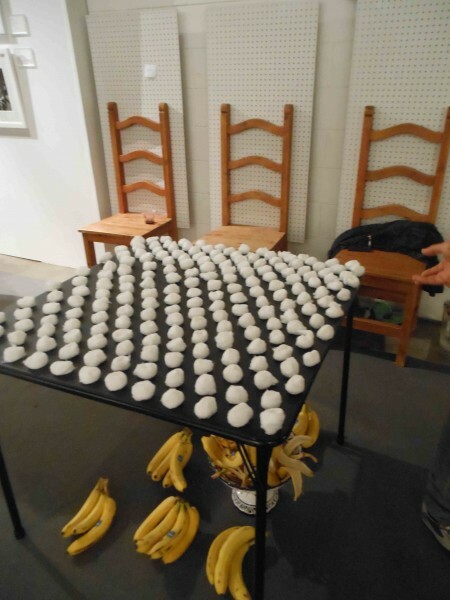 Alberto Aguilar is a Chicago-based artist who creates provocative installations, interventions and performances. I managed to get the most salient parts of his piece in my photographs. Bill Viola’s is perhaps the best known of contemporary video artists, like Dale Chihuly is to glass, Viola is to video. “Bill Viola: Capturing Spectacle and Passion” Exhibition opened September 26, 2014 and continues through January 20, 2015. The IMA features The Crossing (1996), which presents a human figure as it is besieged by water on one side and fire on the other. This is similar to Art Chicago’s Viola presentation of Earth, Air, Fire and Water. Also on view with The Crossing is Viola’s 2000 video, The Quintet of the Silent. 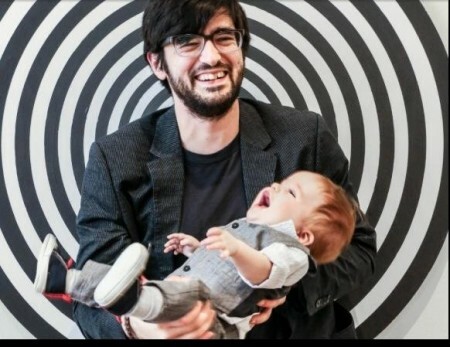 His work is always mesmerizing and the viewing of these two videos would be most rewarding, along with other exhibitions in the museum. 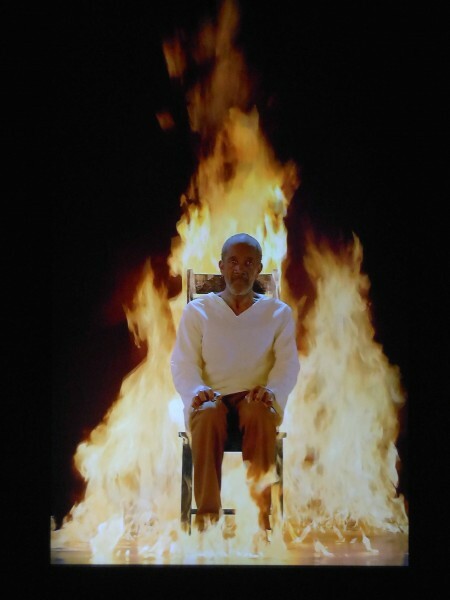 Bill Viola is a pioneer of the medium and internationally known for works that explore experiences of physical and spiritual transformation-birth, death, waking, dreaming, emergence, and transcendence. His works bring you to a state of meditation, a rare and special gift in these hopped-up media/mind-crushing times. Sidebotham clarifies for us: “Everything can be broken down into smaller, oftentimes invisible parts; from building structures to the atoms that make up all living things, everything is made of modules. In nature, systems of organization regulate modules by locating them within an ideal logic. My paintings emulate natural systems of organization by manipulating modules to create organizational systems with an end goal of soliciting a physical reaction from a static image. While this explanation is heady, his work is spellbinding, painstakingly built, both in terms of canvas shapes, which are often non-rectangular, and painted in meticulous layers that the viewer is compelled to attempt to follow. Usually we are foiled, the optical properties of the paintings dizzy us, confound us. Of interest, Sidebotham deploys paraxial imaging. He states, “Bridget Riley and other Op artists referred to paraxial imaging as phantom energies or phantom colors. In optical science the effect is perceived to exist because of light and environmental color reflecting off the eye’s lens before being interpreted by the cortex. The figure ground relationships in my paintings are confounded by the undulation of the system, which creates and uneasy and intense sense of movement within the painting. Although most of a painting’s surface is covered with a system layer, portions of the base white layer are left uncovered. 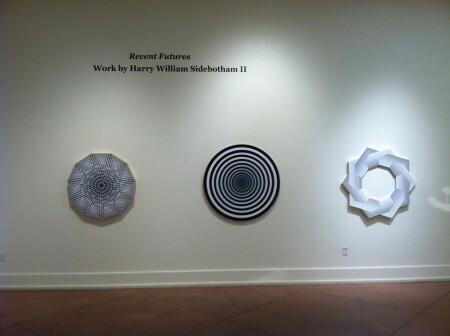 The system interacts with the white base, simultaneously causing portions of the paintings to recede and emerge, making the figure ground relationship ambiguous.” While he gives credit to his artistic ancestors, Sidebotham is advancing Op art with the complexity and uniqueness of his paintings, which have a dynamic pull on the viewer. In discussion with Aeqai’s editor, he thought, and I agree, that Sidebotham, may be using the dynamics of Op to imply the transcendentalism and meditative qualities associated with Tibetan Mandalas. This is a deeper and richer way to see the work in addition to its art-historical basis. All Photos: Cynthia Kukla except for Sidebotham: photo credit: Michelle Pemberton from the Indy Star. 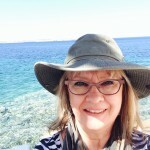 Cynthia Kukla is an artist living in Illinois who writes about art.